The beauty of Muskoka's lakes and rivers have drawn people to its shores for generations. As more and more people call Muskoka home, the necessity of living within our available resources becomes increasingly important. This section provides information on how to be more sustainable in your day-to-day living. 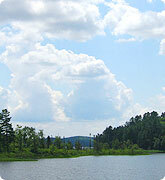 Muskoka also provides an abundance of water-related recreational activities, including boating, swimming, and fishing. Discover how to enjoy Muskoka while minimizing your impact on our water resources. Keep your shoreline healthy, natural and beautiful. Learn how to garden and landscape naturally. Be an enviro-boater when out on the water. Find products that are better for the environment and healthier for you. Looking for a public beach in Muskoka? Check out these stewardship resources and organizations. What can you do to protect this sensive habitat? Have a great lawn or garden without impacting water quality. Make you own cleaners and feel better about the products you use around your home. Information and links to sites and resources to help you become a watershed steward. Learn more about recreational activities in Muskoka.